I’ve wrapped up the first arc of my Shadowrun campaign and, thanks largely to the timing and the Star Wars hype going around, I’m getting started with a new game before picking up Shadowrun again. I’m running the Fantasy Flight Star Wars system, which I’m excited to run. It’s a somewhat unwieldy system with three “core” books, so I’ve slimmed things down a little bit to make it a bit more accessible. 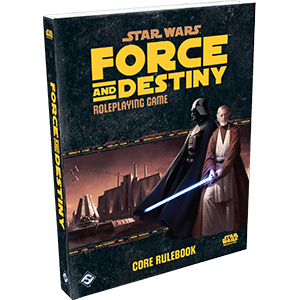 For the most part, my players will only be using the new Force and Destiny book. The premise should be fun. Set right around the time of Episode IV, the party is a collection of Force-sensitives who were slated to train at the Jedi Temple but avoided the Purge and have been hiding out ever since. They’ve been raised on Coruscant by a loyal and savvy local businessman (Dexter Jettster, of Dex’s Diner) and kept out of harm’s way. It’s a reasonable arrangement, with the kids helping out at the diner and picking up some tricks in secret. It keeps everyone together and with roughly aligned goals even if they have wildly different personalities; they’re more like a family than a party of convenience. I’m looking forward to running in parallel with the original trilogy, writing for and showing off a different view of events as the movie plots play out (elsewhere in the galaxy). I like the “party of nascent Jedi” concept, too, especially since with this setup I can lean on the interesting mythology and have it be relevant to all of the characters, but not force everyone to be the usual berobed lightsaber-wielding knights. Systemically, I’m also interested in seeing how the game plays out. It’s a much, much less deadly game than Shadowrun is in general, which makes for some interesting choices. It should feel like it’s a lot less necessary to make extremely detailed plans and avoid risk at all costs, and I think that’ll be a good break from the sometimes-oppressive Shadowrun setting, where one wrong move and horrible things happen to everyone. I really like that the system has clearly-defined degrees of success, along with a non-binary resolution system. There’s more to a roll than whether you simply succeeded or failed, and it’s entirely possible to fail but still have something good happen or succeed and still have something go wrong. It makes even failed rolls interesting as a player, and gives me as the DM a lot more hooks to attach interesting things to. The big concern I have is writing time. I usually write campaigns for about three to six months prior to the first session, and I’m compressing that time into about three weeks. I’m taking next week off of running game because there’s an Infinity tournament that day, but it also gives me more time to get a lead on writing this campaign. Because I don’t have time to extensively map out every possible set of actions that the group can take (notably, I’ve done this in the past and as I’ve mentioned previously, throw out about 80% of everything I write), I’m adopting a style of writing that I used for the previous Star Wars game I ran. Instead of a highly detailed tree, I’m essentially writing little “blobs” of content and connecting them on the fly, adapting to what the group is doing and sometimes stringing them together. My biggest worry about this approach is that it can lead to a “monster of the week” sort of feel, though I think even that can be fun for a little while. I’ve got a big group for this one– seven or eight players– and I suspect there will be some amount of cycling that goes on as some people can make it some days but not others. It’s a good, balanced group, though, and one of the nice things about FFG’s Star Wars system is that it splits the usual party roles up enough to prevent certain common problems from arising. There won’t be a disaster because the one Face character isn’t around, and they’re not going to suddenly have a combat disaster because the healer can’t make it that night. I should be able to run just fine even if any one or two characters are missing, which is perfect. I’m really looking forward to running this one. It’s got some cool moments already, and I look forward to dropping the party on Taris once again.